Flyers defenseman Travis Sanheim skates with the puck against the Minnesota Wild on Saturday, November 11, 2017 in Philadelphia. Travis Sanheim is rejoining the Flyers under "emergency conditions''. The emergency presumably is the continued unavailability of Johnny Oduya, who was injured in the first period of the first game he played with the Flyers after being claimed from Ottawa on waivers. 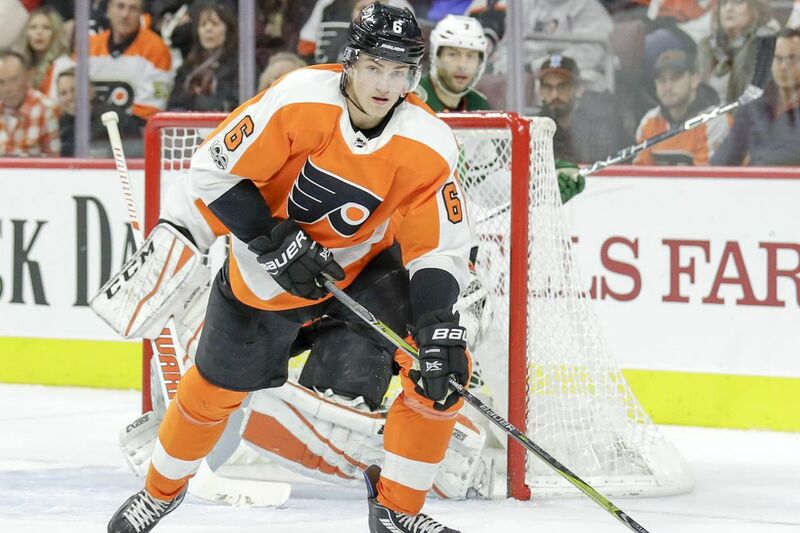 It also means that another Flyers defenseman will be unavailable when the Flyers host the Winnipeg Jets Saturday afternoon at the Wells Fargo Center. Andrew MacDonald held his head and was slow to get to his feet after a collision along the back boards during the second period, but finished the game. Brandon Manning seems to be dealing with some type of lower body injury as well. In either case, it is an opportunity for Sanheim, the 2014 first-round pick (17th overall) who has played well for the Phantoms since getting regular minutes again, to change the narrative that first led to his benching in late December, and his ultimate demotion to Lehigh Valley on Jan. 23. In 35 games with the Flyers, Sanheim, 21, had one goal and four assists and was a minus-10. Although his 54.2 Corsi For percentage indicated the Flyers had puck possession more often than they didn't with him on the ice, his misplays and misreads were recurring and often harrowing events that ultimately soured Flyers coach Dave Hakstol. That has not been the case at Lehigh Valley since. Paired with prospect Philippe Myers, Sanheim has a goal and 14 assists in 18 games since joining the Phantoms and was a plus-14.